"Waffles are an excellent source of energy and raw materials." Karen 7 appears to be a female human of approximately 16, but she is actually a sentient machine. Karen 7 lacks the skills to handle everyday emotions. When faced with a complex emotional issue, she seems cold and uncaring to those around her. Most people can pick up on this easily. However, Karen will protect and defend anyone she deems a friend or with whom has what she thinks is an emotional tie. She doesn't really have a way of showing emotional attachment and thinks this is the best way. In combat Karen is extremely focused on the target at hand, normally picking out the greatest apparent threat. She also makes what she sees as the most logical decision based on various victory conditions. This is often misunderstood as being cold or amoral. She is willing to sacrifice a few to save many. Exploration: The character lives to seek out new places and new ideas. Enemy: Karen 7 is pursued by Karen X, her predecessor. 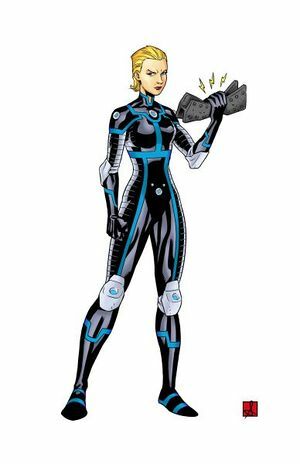 Karen 7 (along with Karens 1 through 6) was created by Doctor Herbert West, a brilliant if somewhat unbalanced inventor and engineer, who was well known as a weapon designer for both the government and a number of paranormals during the 1960s through the 1990s. The Karen units were based on a military prototype West had been developing in the mid-1990s. The unfortunate death of West's daughter in 1996 in an automobile accident marked the end of West's professional career. He withdrew from the world and devoted the remainder of his life to the Karen Project: an attempt to create a perfect, immortal receptacle for Karen West's stored memories and personality. Unfortunately, Dr. West died before accomplishing that goal. When Karen 7 woke up, she was alone in a burned-out laboratory that had been abandoned for months, with no knowledge of where or who she was. Since then, Karen 7 has roamed the world, learning about humanity and trying to find a place where she belongs. Like her predecessors, Karen 7 was created using an experimental skeletal combat chassis, composed primarily of Grade 5 and Grade 38 titanium alloys with some carbon fiber structural members. The combat chassis has increased lifting capabilities, reinforced sub-dermal body armor, and a highly responsive fiber-optic control system: combined, these systems give Karen 7 strength and speed well beyond anything attainable by human beings. In addition, she possesses an array of enhanced senses, enabling her to perceive wavelengths of light above and below those visible to humans. As a synthetic being, Karen 7 is immune to most environmental hazards which would endanger a human being. She is unaffected by heat, cold, poisons, pathogens, radiation, and vacuum. This page was last modified on 26 November 2014, at 14:24.